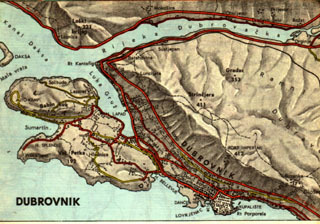 Raccoon obtained two road-maps of former Yugoslavia for this project. The one from the year 2000 and the one from the year 1967, from at about when the Yu-rock generation was born. Tragically, not much has changed between the two maps. Some roads and bridges were built. 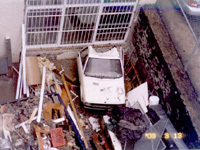 More were destroyed. The year 2000 road-map of countries that emerged from SFRY will be used as "the" map for Cyber-Yugo. The old map is going to be used for nice old city-map drawings, like this of Dubrovnik. Using Microsoft Sidewinder platform the user will drive a Yugo over that map (blimp view). By pressing the stop pedal, the content will open related to the place where the Yugo icon, at that moment, is on the map. In the beginning those clickable links were mostly going to be web content. But the goal is to develop short video clips for each particular city/region. Here is the first such video clip (56kbps, Windows streaming media) : Croatian Zagorje region. 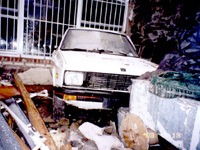 Like the country that once manufactured it, our Yugo suffered some misfortune at its temporary storage space. Given that the damage in no way obstructs its purpose, battered as it is now, it serves its destiny even better. Memories of a broken up country are best kept by a wreck.